郑桂森, 李良景, 吕金波. 北京地热开采中的尾水氟处理方法[J]. 地质通报, 2019, 38(2-3): 397-403. Zheng G S, Li L J, Lü J B. Research on method of processing tail water in geothermal exploration in Beijing[J]. Geological Bulletin of China, 2019, 38(2-3): 397-403. Abstract: The adsorb defluoridation experiment, performed by using pig ash of phosphorite with hydroxy, fly ash from honeycomb briquette and hematite, demonstrated that pig ash of phosphorite with hydroxy easily produced excellent effect, fly ash from honeycomb briquette took second place and hematite performed worse. 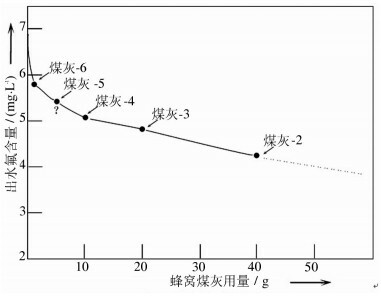 The maximum fluorine adsorption of pig ash of phosphorite with hydroxy could reach 1.28mg/g and 1.00mg/g made by fly ash from honeycomb briquette. 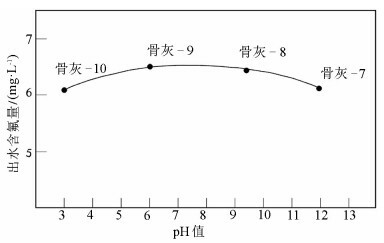 The minimum of effluent fluorine of pig ash of phosphorite with hydroxy is 0.39mg/L, with 94.3% defluoridation. By fly ash from honeycomb briquette, fluorine can be 4.25mg/L at the lowest, close to the Beijing Tertiary Emission Standard. In different pH values, the results indicated that, in acidic condition, adsorption of fly ash from honeycomb briquette could be much improved, and effluent fluorine reducing remarkably was 1.44mg/L. 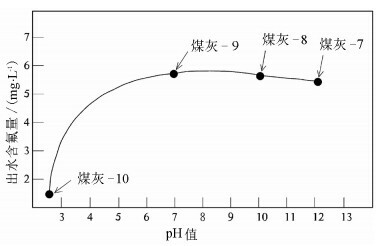 The effect of pH changing on defluoridation by pig ash of phosphorite with hydroxy was less. 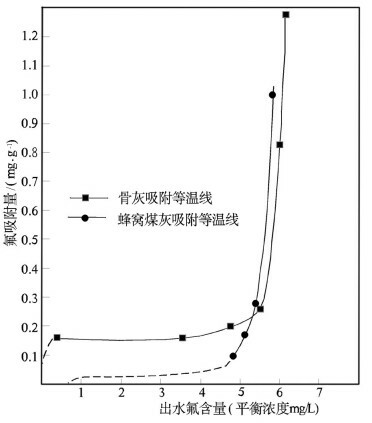 Isothermal adsorption curve of fly ash from honeycomb briquette and pig ash of phosphorite with hydroxy represented Second Kind Curve summarized by Tang Shouyin, which showed adsorption is made by multi-layer molecule. Based on fluorine adsorption and effluent fluorine of fly ash from honeycomb briquette and pig ash of phosphorite with hydroxy, the authors estimated coefficient of B.E.T. 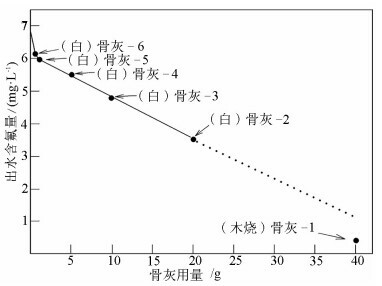 expression in isothermal adsorption curve. 煤灰-5 蜂窝煤灰 5.00 1000 6.80 5.40? 0.280? 20.6? 安可士, 黄尚瑶. 中国地热资源特征[M]. 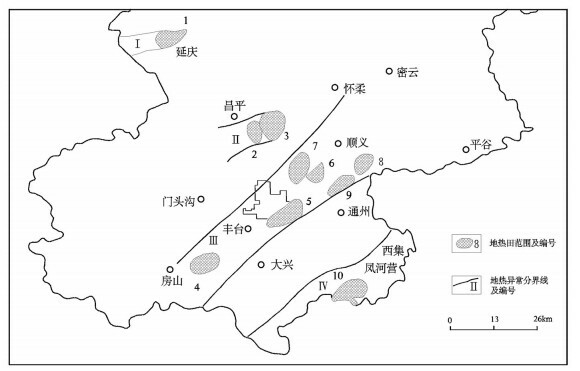 北京: 地质出版社, 1980: 10-17. 国家环境保护总局科技标准司. 城市污水处理及污染防治技术指南[M]. 北京: 中国环境科学出版社, 2001. 黄尚瑶, 胡素敏. 火山·温泉·地热能[M]. 北京: 地质出版社, 1986: 44-64. 兰文艺, 邵刚. 实用环境工程手册[M]. 北京: 化学工业出版社, 2002. 李鹏程, 宋金明. 海洋化工与海水利用技术[M]. 北京: 海洋出版社, 2001. 齐宝翔. 天津地区的地下热水[M]. 北京: 科学出版社, 1981: 81-84. 上海市环境保护局. 废水物化处理[M]. 上海: 同济大学出版社, 1999. 邵林. 水处理用离子交换树脂[M]. 北京: 水利电力出版社, 1989. 李亚峰, 佟玉衡, 陈立杰. 实用废水处理技术[M]. 北京: 化学工业出版社, 1998. 王大纯. 我国开发利用地热能中的若干问题[M]. 北京: 科学出版社, 1981: 25-28. 王湛. 膜分离技术基础[M]. 北京: 化学工业出版社, 2000. 吴方之, 蒋勋烈. 羊八井地热试验电站[M]. 重庆: 科学技术文献出版社重庆分社, 1985: 16-26. 严瑞宣. 水处理应用剂手册[M]. 北京: 化学工业出版社, 2000: 495. 张铨昌, 杨华蕊, 韩成. 天然沸石离子交换性能及其应用[M]. 北京: 科学出版社, 1986. Minear R A, Patterson J W. Carbonate Precipitation Treatment for Cadmium[C]//the 8th WWEMA Industrial Polution Conference, Houston. TX. 1980. 吕金波, 刘振锋, 李良景, 等. 北京市幅(J50C001002)1:25万区域地质调查[J]. 中国科技成果, 2012, 19: 40-42. 炭素材料学会编[日].高尚愚, 陈维, 译.活性炭基础与应用[M].北京: 中国林业出版社, 1984. 汪大翬, 徐新华, 宋爽. 工业废水中专项污染物处理手册[M]. 北京: 化学工业出版社, 2000. 黄继国, 张永祥, 曹玉清, 等. 含氟废水的粉煤灰处理实验研究[J]. 水文地质工程地质, 2001. 王建龙, 文湘华. 现代环境生物技术[M]. 北京: 清华大学出版社, 2001. 唐受印, 汪大翬, 等. 废水处理工程[M]. 北京: 化学工业出版社, 1998: 1-115.